Ta'Lippija Tower built by the Knights Hospitaller is located on the cliffs of the north west coast of Malta, about 100m above sea level. It was built in 1637 upon orders by Grand Master Juan de Lascaris-Castellar. The watch tower formed part of the intricate coastal defence network constructed by the Knights of St. John. Due to the constant threat of Muslim raids and incursion, for centuries the coastline of Malta has been dotted with lookout posts or watch towers that were built by the Knights of St. John (Knights Hospitaller, Knights of Malta) during the 17th century. These towers were manned nightly to watch the seaward approaches and to raise the alarm in the event of imminent threat. The positioning of these towers was planned as such so that one could see both neighbouring towers, which acted as an early warning system against invaders. As soon as one tower spotted a suspicious event, a fire signal was started which was picked up by the neighbouring towers, in so doing carrying on the message. 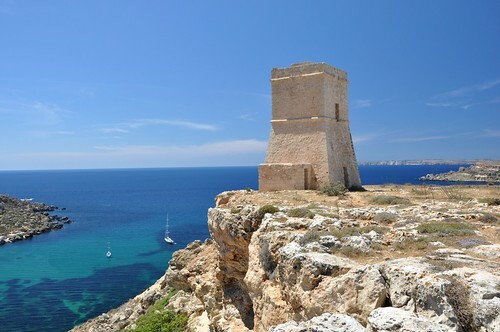 A number of coastal towers were built during the reigns of Grand Master Alof de Wignacourt (1601–1622), Grand Master Paul Lascaris-Castellar (1636–1657) and Grand Master Martin de Redin (1657–1660). The aim was to strengthen Malta’s coastal guarding system. Under the reign of Grand Master Juan de Lascaris-Castellar, seven towers were built in the period 1637–1640. Lascaris paid for the building of these towers out of his own pocket, such was his dedication to fortifying Malta’s coastal defences. With the exception of St. Agatha’s Tower in Mellieha (built in Wignacourt’s style), the Lascaris towers are smaller than Wignacourt’s and consisted of two storeys, a flat roof and a parapet.